If you are Twitter user then you probably know Hashtags. The # symbol, called a hashtag, is used to mark keywords or topics in a Tweet. These keywords, preceded by the pound sign (#), can add information related to a context. That’s when you see something in a tweet that has a # prefix. Very useful when more tweets are related to an event or topic. 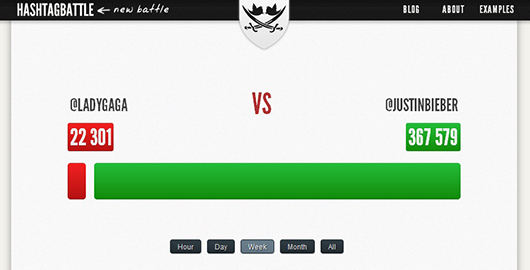 HashtagBattle a service created by Camille Roux to compares the popularity of two hashtags. Within seconds, a graph will refresh automatically displays the number of tweets on which these keywords. It is possible to obtain results over several periods like the last hour, day, week or month. HashtagBattle is the type of service that can be useful if you organize an event.